Fuengirola is a municipality in the province of Malaga that is very popular amongst the tourists that visit the Costa del Sol. 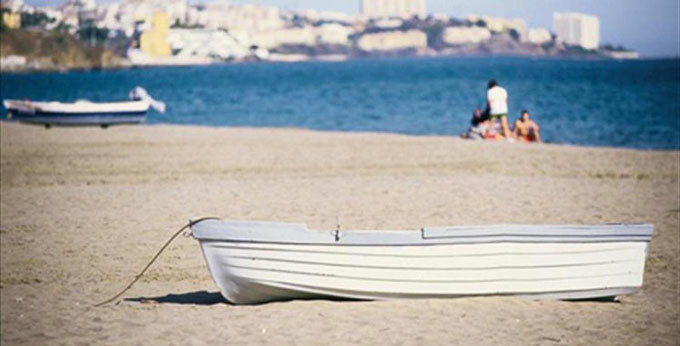 In Fuengirola we’ll find beautiful beaches and good services along its 8 kilometre seafront. Fuengirola is situated between Benalmadena and Mijas. It’s very simple to reach Fuengirola and its wonderful beaches from Malaga, and if you need it, you can check out our guide to find out how to get from Malaga to Fuengirola. The Castle beach’s name come from the Sohail castle as it is situated right beside it. This beach is considered one of the best beaches in Fuengirola and can be reached from the N-340, turning off at the Sohail castle exit, the last turnoff of Fuengirola’s municipality. This beach has a very large parking area. Services: Sunbeds and sunshades to hire, bus stop near the beach, showers, camping site near the beach, beach bars and restaurants, first aid services, etc..
To get to the Santa Amalia beach you must head towards the centre of Fuengirola from the N-340, once you reach the town hall, take the calle Marconi down towards the beach. It has a length of approximately 1 km. and offers all the services. From Malaga, on the N340, take the bypass to Los Boliches/Fuengirola and head down to the Plaza de San Raphael towards the sea and you will get to this beach. It has managed to maintain the blue flag distinction for many years, and all the body showers and taps for the feet are easily accessible with ramps for the disabled. It’s a very busy beach during the summer months. To get to Las Gaviotas beach you must take the first turnoff towards Los Boliches from the N-340. This beach has golden sand. It’s one of the favourites by many tourists to spend an enjoyable day on the beach and have lunch in one of the restaurants or beach bars in the area. The beach of Las Gaviotas has a great amount of services to offer, like public showers, vigilance towers, local police, seafront promenade, water sports, rubbish bins, bars and restaurants. The Torreblanca beach is situated just past Los Boliches along the seafront towards Benalmadena Costa, but it’s reached the same way as if you were going to Las Gaviotas, but turning left when reaching the seafront towards Torreblanca. It’s 1.600 metres long and 30 metres wide, with fine golden sand and very popular on weekends during the summer. Services: It offers all the necessary services, even a parking lot nearby, as well as showers, vigilance towers, local police, first aid, sunbeds to hire and a wide range of beach bars, bars and restaurants along its whole promenade. It can be reached by car, bus or train; on the suburban line (cercanias), you must get off at the Torreblanca train stop. The Carvajal beach is situated just passed the Torreblanca beach, on the outskirts of Fuengirola’s municipality, along the seafront towards Benalmadena Costa. It’s another one of the best beaches in Fuengirola, and as it’s not as popular as the more central beaches in summer, it’s a great place for a relaxed day on the beach. Services: The Carvajal beach has special ramps that make it easily accessible for the disabled. it also has a playground and a red cross point. Enjoy a splendid day on the beach in Carvajal or enjoy good meal in one of its beach bars.